, a man of learning, a patron of learning, and a distinguished statesman, in the four discordant reigns of Henry VIII. Edward VI. queen Mary, and queen Elizabeth, was the son of John Petre, of Tornewton, in the parish of Tor-brian, in Devonshire, and born either at Exeter or Tor-newton. After some ele­-mentary education, probably at his native place, he was entered of Exeter college, Oxford; and when he had studied there for a while with diligence and success, he was, in 1523, elected a fellow of All Souls. We may suppose that he became sensible of the importance of learning, and of the value of such seminaries, as he afterwards proved a liberal benefactor to both these colleges. His intention being to practise in the civil law courts, he took his bachelor’s degree in that faculty in July 1526, ant) his doctor’s in 1532, and the following year was admitted into the college of Advocates. It does not appear, however, that he left Oxford on this account, but was made principal of Peckwater Inn, now part of Christ Church; and he became soon after tutor to the son of Thomas Boleyn, earl of Wiltshire. Hitherto he had devoted his time to literature, and Lad no other view than to rise in his profession; but being noticed by lord Cromwell, while in the Wiltshire family, as a young man of talents, he was introduced by him at court, and appeared to so much advantage, that Henry VIII. recommended the farther improvement that travelling might contribute, and allowed him a handsome pension for his expenses. 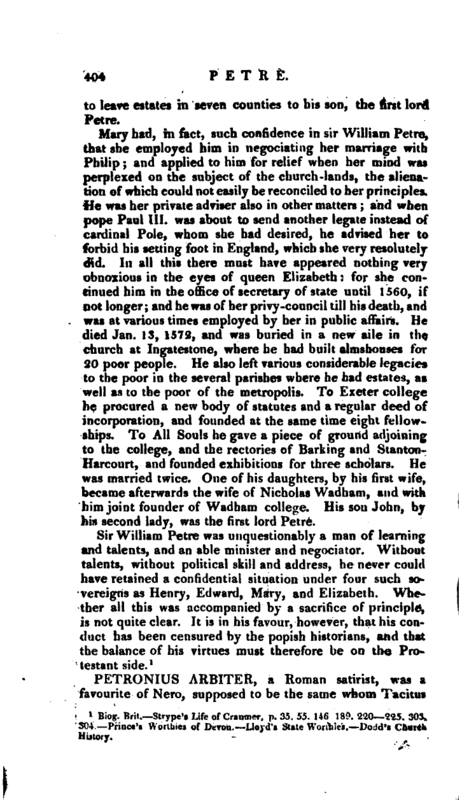 His manners and accomplishments, on his return, appear to have fulfilled the expectations of his patrons, and he was appointed Latin secretary in the secretary of state’s office, the first step in his public life; and which led to those preferments and opulence, which enabled him to become the founder of a noble family. In 1535, when a general visitation of the monasteries was determined upon, Cromwell, who considered him as a very fit person for this business, caused his name to be inserted in the commission, in which he is styled one of the clerks in chancery; and he appears also to have been, at this time, master of the requests. Having acquitted himself in this employment to the satisfaction of the king, who was determined on the dissolution of these religious houses, he was not only rewarded, in 1538 and 1539, with very large grants of abbey-lands, but rveceived the honour | of knighthood. In 1543, having become still more acceptable at court, he was sworn of the privy-council, and appointed one of the principal secretaries of state; and accordingly we find his name signed to every act of council during this reign. In 154J-, such was his consequence, that he was not only appointed one of the regency in the absence of Henry VIII. in France, but obtained special licence to retain twenty men, besides his own menial servants, and to give them liveries, badges, and cognizances. In king Henry’s will, dated Dec. 30, 1546, Sir William Petre was nominated one of the assistant counsellors to Edward VI. and was not only continued in the privycouncil and in his office of secretary of state, but was also, in I 549, made treasurer of the court of first fruits for life; and, the year following, one of the commissioners to treat of peace with the French at Guisnes. 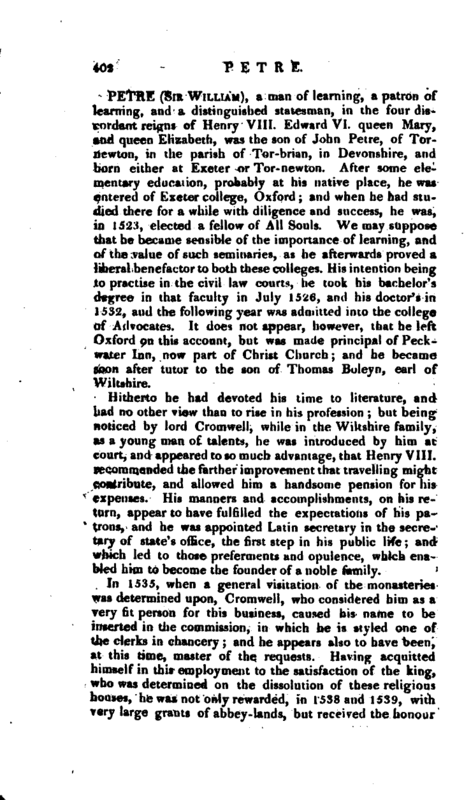 He was also in several commissions for ecclesiastical affairs, the purpose of which was the establishment of the refo‘rmed religion; and, in the course of these, was one of the persons before whom both Bonner and Gardiner were cited to ’answer for their conduct; two men of such vindictive tempers, that it might have been expected they would have taken the first opportunity of revenge that presented itself. Owing, however, to some reasons with which we are unacquainted, queen Mary, when she came to the throne, not -only overlooked sir William’s zeal for the reformed religion, but continued him in his office of secretary of state, and made him chancellor of the garter, in the first year of her reign. Nor was this the most remarkable instance of her favour. The dissolution of the monasteries was a measure which had given great offence to the adherents of popery; and the grant of abbey-lands to laymen appeared the vilest sacrilege. It was natural to think, therefore, that popery being now established, some steps would be taken to resume those lands, and reinstate the original possessors. 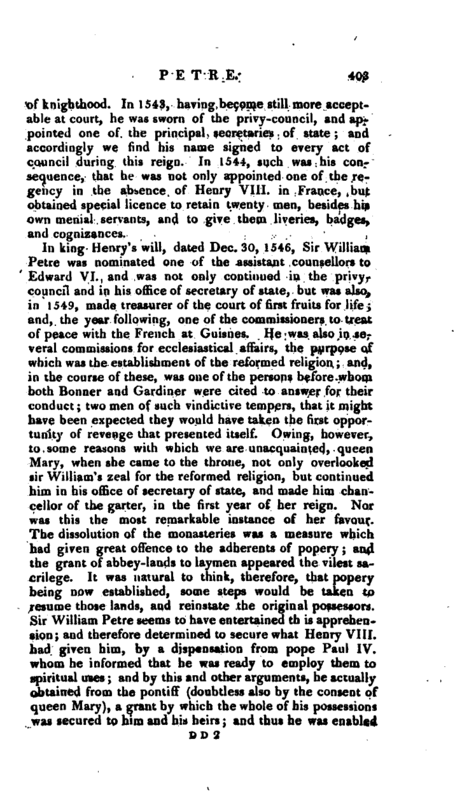 Sir William Petre seems to have entertained th is apprehension; and therefore determined to secure what Henry VIII. had given him, by a dispensation from pope Paul IV. whom he informed that he was ready to employ them to spiritual uses; and by this and other arguments, he actually obtained from the pontiff (doubtless also by the consent of queen Mary), a grant by which the whole of his possessions was secured to him and his heirs; and thus he was enabled | to leave estates in seven counties to his son, the first lord Petre. Biog. Brit. —Strype’s Life of Crannier, p. 35. 55. 146 139. 220—225. 303, 304. Prince’s Worthies of Devon. Lloyd’s State Worthies. Dodd’s Church History.